Carl Stokes was mayor of Cleveland from 1967 – 1971. He was the first African-American elected to mayor in a large US city. In 1967 he ran against Seth Chase Taft, the grandson of former President Taft and won. 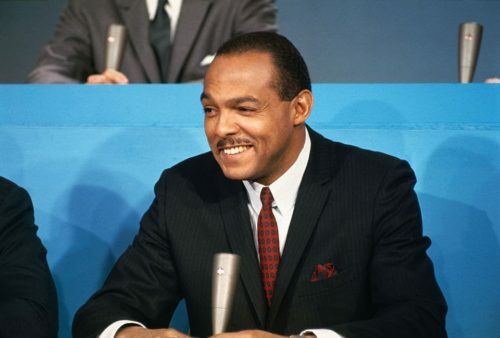 Carl Stokes was born in 1927 in Cleveland. His family lived in the first public housing projects in the city. He would go on to earn a law degree in 1956 and become the assistant prosecuting attorney for Cuyahoga County. He also served Cleveland in a very tumultuous era. One of his greatest accomplishments as mayor was opening up city positions to more African Americans and women. After his turn at mayor he would serve as the United Auto Workers’ legal counsel, a municipal judge and even Ambassador to the Seychelles. He passed away in Cleveland in 1996. Today you can see his name on the Federal Courthouse Building downtown.